Both the Action Level Exceedance (ALE) and the Action Level Exceedance II (ALE II) reports start by running an Analytical Results (AR) Report. Then each row in the AR report output is compared to the columns of the Action Level tables to see if the Action Level matches that row. For both ALE reports, matching starts with the CAS_RN from the AR Report being matched to the PARAM_CODE in DT_ACTION_LEVEL_PARAMETER. All of the other matching in the original ALE Report is also automatic if the columns in either of the Action Level tables have a value. The original ALE Report does not match for the new columns in the DT_ACTION_LEVEL table, GEOLOGIC_UNIT or LAND_USE. In the example below, only matching for MATRIX will be performed. All of the other (i.e. 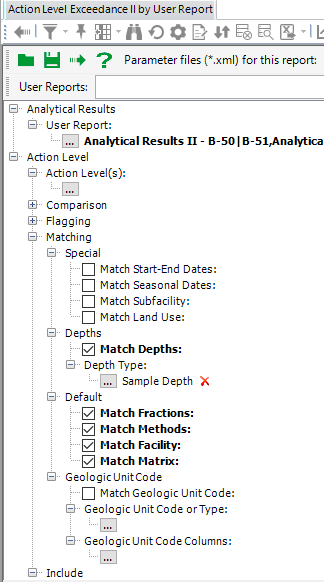 non-CAS_RN) matching in the ALE II Report are only performed if the Matching report parameter is selected and the columns in the Action Level tables have a value. Warning: The START_DATE and END_DATE in DT_ACTION_LEVEL should be used with caution, if at all. Generally, when an agency publishes a new set of action level values, those values are used to evaluate all analytical result data before the published date and after, until an action plan (e.g. a Record of Decision) is approved or until a new set of action level values is published. Setting the START_DATE to the published date, for example, would incorrectly exclude all analytical results with a SAMPLE_DATE before that START_DATE. The MIN_START_DEPTH and MAX_END_DEPTH in the DT_ACTION_LEVEL table are primarily used to match an Action Level to either Surface Soil or Sub-surface Soil. For example, given the following two Action Levels, the samples below are matched as described. 1.ACTION_LEVEL_CODE = "SURF" with a MIN_START_DEPTH = 0 and a MAX_END_DEPTH = 2. 2.ACTION_LEVEL_CODE = "SUB" with a MIN_START_DEPTH = 2 and a MAX_END_DEPTH = 'NULL'.